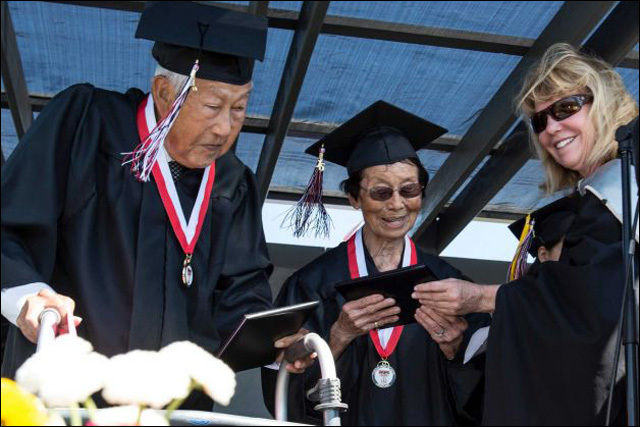 Congratulations to George and Miko Kaihara, Tustin Union High School, Class of 1943. As teenagers, George and Miko Kaihara were among the thousands of Japanese Americans on the West Coast who were forced into internment camps during World War II. Uprooted from their lives, they never got to graduate from high school with their classmates. But this week, over seven decades later, they received their long overdue diplomas from Tustin Union High School. George and Miko, who should have graduated from Tustin Union in 1943, received their diplomas at the Poston internment camp in the Arizona desert. 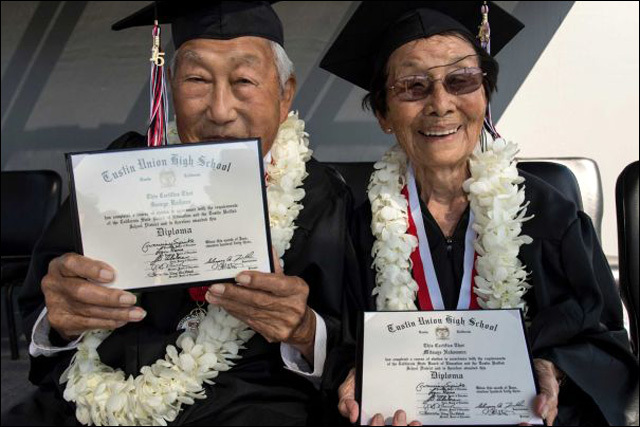 On Thursday, at 90 years old -- a week before their 65th wedding anniversary -- the Kaiharas donned caps and gowns and walked with the 550 students of the Class of 2015 to graduate from their original alma mater, now called Tustin High School. Hayden was getting his hair cut last year in his favorite Tustin shop when stylist Jan Beggins mentioned family friends George and Miko Kaihara were also in the Class of 1943. She called Miko and passed the phone to Hayden. Soon, he was driving the couple around Tustin as they reminisced about their interrupted high school days. Shortly after the Kaiharas were taken away, Hayden, then 17, enlisted in the Navy. Before heading to the Pacific to fight the Japanese, Hayden and six other enlisted classmates got leave to participate in their graduation ceremony. Hayden, who still practices estate law, reached out to Tustin Unified to see if the Kaiharas could join the 2015 festivities. Yesterday, with their sons and grandchildren in attendance, George and Miko crossed the stage at Tustin High and finally received their diplomas, which read "Tustin Union High School - 1943."